Below you will find a chronological listing of collected comments and responses from the complete Mercedes Gen-In site, these detail many elements of help and support that has been offered to readers. Comments and replies are listed from the most recently published. Thank you for helping to make this site the Mercedes Benz Resource that it is today! Hi everybody, I just succeeded , following advises up here, wired AUX on my sound 5 CD radio in my Mercedes b class W245. Thanks for advises. At this point I have another idea-possibly to replace existing sound 5 radio with new 7” radio set (touch screen, GPS,….) as now a days cars have. There is large offer on web but problem I am facing is dash configuration, not possible to mount such set, different dash configuration should be mounted. I think B class w245 with sound 20 has such dash. Has somebody advise where such dash can be found or any experience with . Do you think it is possible for a faulty LCD to kill all instruments in the cluster? It sounds more likely to be either a supply fuse, cabling, connector or internal voltage regulator. I doubt the LCD panel unit itself could cause such a problem. I have a facelift r170 SLK230 and using the great description above I’ve started doing the work to replace the prop centre bearing. I have taken three of the six bolts off the rear flex disk but the rear section of the prop shaft does not move forward. I guess I’ve taken off the wrong three bolts and that the flex disk is removed with the rear section of the prop? Also you mention that the rear prop will slide forward two inches….does it really have that much movement to clear the diff spigot? 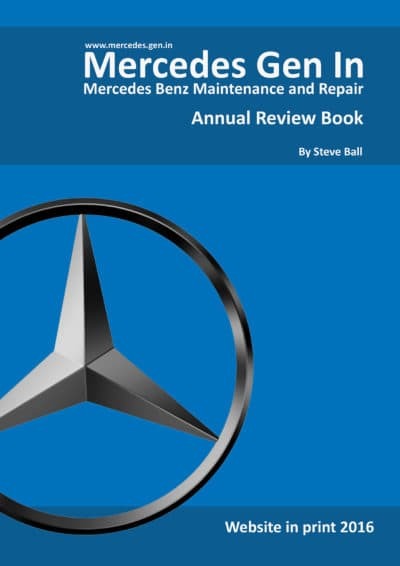 The Mercedes workshop manual for the older R170 states that you need to remove complete propshaft, which requires you remove rear engine mount and support the transmission. I’m hoping this is a variation on the post and pre-facelift versions? I have a Sprinter 412D 2.9 904 chassis/platform unit 4 tonne. I found over a period of 18 months I had a lot of black oily deposit all over the top of the engine. I mentioned it to my garage and they said that “diesels do that” and it seemed to be getting worse, but two annual services showed up nothing and the vehicle used 1 litre of oil/10,000 miles. I was fitting a new pollen filter and was having issues getting the cover back on when I knocked the EGR valve, AND IT MOVED!! One bolt was missing and the other was half undone. I took the EGR (its non electronic!!) off and it was totally blocked solid and the vac valve did not work. I fitted a replacement which works well BUT as soon as the engine is started the valve opens and presumably stays open. I note that the vac pipe is connected to a control valve on the bulkhead which I assume is connected to the ECU. Does that mean that the control valve is faulty as the odd post I have found seems to suggest that when cold the valve should remain closed . I get black smoke at idle or over-run but no black smoke when I am pulling hard. I have ordered a replacement control valve and I assume that the control valve will open and close the EGR on demand depending what the engine is doing and at what temperature. Should the opening of the mechanical EGR valve be variable, or just open or closed. On another subject, I asked last year about getting a replacement LHD exhaust system. Easier said than done if you have a 904 chassis platform unit. The after market guys don’t want to know because the 904 is the base for a complete body, and is often modified. I ended up getting a custom built stainless steel system built by Fast Road Conversions at Ashford in Kent. Cost £550 + vat with a vehicle lifetime guarantee. It took them 5 hours to build it from scratch and it is a lot quieter than the existing Merc system and cost the same as the Merc parts excluding fitting. It could literally be one or a selection of things. You won’t know until you get a code read to at least give you a starting point. Hope that helps! will a 97 s600 key start the car without batteries ? If the alarm is in its disarmed state and the car is unlocked, it should yes. One question to clarify. I have a 2012 vw crafter and I need to remove the hub. If I remove the 4 reverse torx bolts as you state, can the hub be remove without removing the half shaft too? Will either the hub or hub mad half shaft come away without the need for a puller tool? The ‘Hub’ as I understand you referring to as the part the wheel bolts screw into, is a turned part of the end of half shaft and is not removable as a separate assembly. You will not need a puller tool just a tap round with a soft faced hammer. The LED backlight on the odometer does not shut off after the vehicle is turned off. This (I think) has been causing the battery to drain when the van has been sitting for extended periods of time. Hi Harry, could be the ignition switch is faulty allowing current to pass to aux circuits when in off position or a door closure switch not making – this means the vehicle thinks a door is open and illuminates the odometer. You should be able to open a door and the milage display illuminates.